Varitek and his return remains the biggest injury question mark for 2002. Team will keep two catchers in case the next CT scan is discouraging. News on Jason Varitek's recovery continues to be vague and cryptic. The injury which the team initially reported as "not major" on June 8th remains the biggest question mark as the Sox hope to start the 2002 season on a healthy note. We will update you on Jason's progress throughout the off-season. Varitek resting, healing. Duke finally admits earliest return is not until 2002. As reported on bostondirtdogs.com on August 12th, Boston Red Sox General Manager finally confirmed in a chat on redsox.com yesterday that catcher Jason Varitek would not be returning until 2002 at the earliest. Duquette said, "Jason Varitek is continuing his rehabilitation program for his elbow and we expect that he will return at the start of Spring Training 2002. It's difficult for any team to lose a catcher in the middle of a season because catchers are involved in every defensive play in the ballgame. Jason made great improvement in his slugging and on-base percentage and was playing very well at the time of his injury. He probably would have been an All-Star." Log on for further details as they become available. Update 9/1/01: According to my medical sources, the problem is his elbow is still bad. It had healed, but was re-torn, so he isn't going to be able to throw. Those movements can't be made and batting will be almost impossible. If he tries to come back, he's chancing next year and further. Varitek continues to rest injured elbow, report on post-op damage encouraging. Boston Red Sox catcher Jason Varitek will not be returning to the Red Sox line-up for the remainder of the 2001 season as reported here last week. And there's a possibility he may not be ready for start of the 2002 season as well. However, an encouraging report today from the Boston Herald states that California Angels team doctor, the renowned Lewis Yocum, reassured Varitek that the recent nerve discomfort suffered is not a result of post-operative rehabilitation, but is the result of the initial impact inflicted on June 7th in a game against the Detroit Tigers at Fenway Park. The Boston Globe reports today that Varitek's condition remains unchanged and that according to people close to Varitek, he will most likely not be back until the start of the 2002 season. After initial progress on his injured right elbow earlier this month, Varitek suffered a major setback prior to his August 9th, MRI at the UMass Medical Center in Worcester. Additional nerve damage to his elbow took place during the rehabilitation process leaving Varitek "confused and upset with the medical treatment received" according to our sources. Varitek "could barely pick up a baseball" and his arm was "numb" after some initial light throwing during the first week of August. Did the Red Sox try to rush Varitek back too soon in order to make a successful playoff run in the final year of the Yawkee Trust? Is there a clear conflict of interest when the head of the team's medical staff is also a part owner who stands to make millions if a 'playoff-bound' team is up for sale versus an also ran? Only time will tell. The Boston Globe also confirmed previously that Varitek sought a second opinion regarding his fractured right elbow and that it will take another two weeks before doctors can determine if Varitek will play again this season. The Globe had already confirmed along with the Boston Herald that a setback in Jason Varitek's recovery from elbow surgery had taken place and that Varitek is concerned about his treatment. Red Sox General Manager Dan Duquette also confirmed the setback and provided details after a follow-up question by Red Sox broadcaster Jerry Trupiano during his nightly pre-game radio program on Wednesday, August 15th. Duquette stated "I don't know that the fracture is healing as fast as they hoped it would" regarding the swelling and nerve damage in Varitek's elbow. Duquette went on to say that Varitek "would need more time" than originally anticipated in the recovery process due to the recent setback. Duquette has not had to answer any additional questions on Varitek's condition since his firing of Jimy Williams last Thursday. Additionally, bostondirtdogs.com confirmed on last week, through an additional source close to the team, that Varitek was "visibly upset" at the Red Sox brass and medical staff for the way they have handled the rehabilitation program, set the timetable for his return, and for the course of treatment prescribed. This story was first delivered to our readers on Sunday, August 12th, and also on that day's Tony Massarotti and Bob Neumeier radio show on WEEI AM 850. We will provide continuing coverage of the Varitek rehabilitation story. Check here for breaking details. Varitek out for season, suffers severe setback after pushed to make a quick return by Sox medical team. Boston Red Sox catcher Jason Varitek will not be returning to the Red Sox line-up for the remainder of the 2001 season. And he may not be ready for start of the 2002 season as well. The Boston Globe also confirmed last week that Varitek sought a second opinion regarding his fractured right elbow and that it will take another two weeks before doctors can determine if Varitek will play again this season. The Globe had already confirmed along with the Boston Herald that a setback in Jason Varitek's recovery from elbow surgery had taken place and that Varitek is concerned about his treatment. Red Sox General Manager Dan Duquette, on his nightly pre-game radio program last Wednesday, also confirmed the setback and provided details after a follow-up question by Red Sox broadcaster Jerry Trupiano. Duquette stated "I don't know that the fracture is healing as fast as they hoped it would" regarding the swelling and nerve damage in Varitek's elbow. Duquette went on to say that Varitek "would need more time" than originally anticipated in the recovery process due to the recent setback. Duquette has not had to answer any additional questions on Varitek's condition since his firing of Jimy Williams last Thursday. OUT FOR SEASON, POSSIBLY LONGER. Boston Dirt Dogs learned late last night that Red Sox catcher Jason Varitek will be out of the line-up for the remainder of the 2001 season and may miss the start of the 2002 season as well. Our source, who worked directly on Jason as part of his treatment at the UMass Medical Center in Worcester, confirmed that after his latest treatment on Thursday, Varitek stated that he is unhappy with the rehabilitation program directed by Dr. Arthur Pappas, the embattled head of the Red Sox medical staff. Varitek is "frustrated and angry" and believes the Red Sox "tried to rush him back too fast" and the course of treatment prescribed by Pappas further damaged his shattered elbow which he injured against the Detroit Tigers on June 7th. 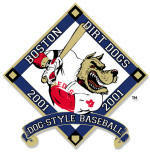 Boston Dirt Dogs will provide continuing coverage of this story and will post updates as they become available.